Wine tasting dinners can really help you learn about wine; and they are a great social event, too! Early on in our wine journey when we found what we thought was a good wine while visiting a winery, we would buy a case and take it home. Too often the wine did not taste nearly as good at home as it had in the tasting room. There were probably several reasons this happenedâ€¦we had been unduly influenced by a friendly tasting room host, plied with cheese or chocolate in the tasting room, or were suffering from fatigue after visiting a number of wineries in one day. Our solution was to just buy a bottle or two, not a case, at the winery, bring it home, and taste it blind against similar wines. Then we could confidently buy more once a wine was a proven favorite. Out of this process came the idea of hosting regular wine tasting dinners. 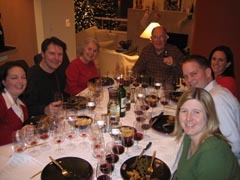 Hosting regular wine tasting dinners in our homes has proved to be a great social event for us as well as an opportunity to compare wines we think we like in a blind-tasting. Now we use wine tasting dinners to evaluate all new wines we come across, not just the ones that we discover on a winery visit. We are sure that there are a number of perfectly good ways to set up a wine tasting dinner, but here is how we do ours: We have eight persons at the tasting and evaluate six different wines. The attendees are Kori and Colby, John and LaGayle, and four other guests, different people for each tasting, who have a similar interest in wine to us. We host the dinner early in the evening on a Friday or Saturday night. Kori and John select the wines to be tasted. There are generally six different wines of the same varietal, although at one tasting we used one wine from each of six different varietals and tried to match the bottles to their varietal. (Now that was a tough tasting.) In most tastings, it is all Australian Shiraz, or all Washington Merlots, or all California Cabs, or all New Zealand Sauvignon Blancs, or whatever. At times, we will have all of the same varietal, say Bordeaux-type blends, but several might be from France, several from the USA, and several from Australia. As you can see, we mix it up to make things interesting as well as to learn and compare different wines from different regions. We have a system for opening the bottles and placing them in the numbered wine bags so that no one, including us, knows which wine is which. And, Kori and John are the only ones who even know the identity of the six wines. The other participants are only told that this is a California Zinfandel tasting, for example. We have forty-eight identical INAO tasting glasses to use at the tasting, six for each of the eight participants. The glasses have a number from 1 to 6 on the base of the stem, so the wine from the bottle in wine bag 1 is poured into glass 1, and so forth. Each participant has a tasting sheet and pencil in order to record their impressions of each wine and score them. At the end of the evening, we ask each guest to tally up their scores and rank the six wines from 1st to 6th. Then we tally up the scores for the eight participants and come up with a consensus ranking and favorite of the group. Some nights the scoring is very close; other nights there is an overwhelming favorite. LaGayle is the chef for the tasting dinner and, together with Colby if grilling is required, prepares the eveningâ€™s meal based on the wines weâ€™ve selected to evaluate. 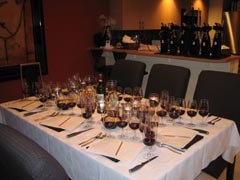 The table is set with a white tablecloth in order to provide a white background for the initial visual tour of each wine. We encourage our guests to do their initial examination and tasting of each wine and record their initial thoughts before having any food. Then we proceed with our dinner courses, which typically include a soup, salad, entrÃ©e, and dessert. We encourage our guests to taste each wine after each course and record how their opinions change or do not change about the wines as the evening progresses. Obviously, if a wine starts out the evening as your 1st place wine and remains in that position all evening through dessert, it is clearly your favorite. We provide unsalted oyster crackers to clear palates between wines (celery is another good palate cleanser). And we always provide and encourage our guests to drink plenty of water, too (at room temperature, without ice). After dessert and each personâ€™s final evaluation of the six wines, we tally up the scores and then reveal each wineâ€™s identity, price, where purchased, and any other information of interest. The resulting discussion and the sipping of a nice dessert wine usually top off a great evening. Quite often, there are surprises in the rankings once the wine labels are known, and sometimes there is some egg on the face of a participant who was a little too cocky before the wines were revealed. We also give out what we call the â€œMaster Wine Tasterâ€ award to the guest whose rankings of the six wines come closest to the consensus of the group that evening.